Yesterday was BeebCamp at the BBC in White City. An opportunity for people at the BBC interested in new technology, new journalism, and new entertainment to come together to share some ideas. If you want to know more about the format of what was billed as an 'unconference' there's some more details here. Panel 1: Are we obsessed by audience feedback? Proposed by Alex Murray at 5 live Interactive, the panel discussed whether the people who get in touch with the BBC have too much influence on what the BBC do. Seemed to be general agreement that while some common editorial sense should be employed when using contributions from the audience the BBC could and should be doing more to engage with the audience. It was acknowledged that saying 'thanks for your comment' wasn't really good enough. Suggestion was that a reprioritisation was needed. A journalist from Radio Current Affairs said he found audience feedback and interactivity useful but was doing it after work in his own time to keep on top of it. Perhaps more BBC journalists should be working full-time in engaging with the users? What we didn't note was the tremendous success of the UGC hub in recent years for news stories, contacts and guests. I also spoke to Steve Bowbrick, the BBC's blogger in residence, at lunch about the possbility that new software could be designed to deal with comments more effectively. We talked about replying to clusters of comments rather than just individuals. Further Reading: Tom Van Aardt's notes on this panel here. To be honest, I didn't really have much to contribute to this panel. I'm more interested in journalism rather than the user-functionality of the website, so skip these notes and read these instead. But Mat Hampson, who led the panel from FM&T, seemed to have lots of good ideas about how to improve the website and was collecting some more from other panelists. There was some discussion about customisation and personalisation. Around 30% of bbc.co.uk users customise the existing home page. The BBC he said needed to get away from gargantuan technology projects and begin to use smaller modules that connect to one another - this after all is the Web 2.0 way. Reassured when Mat said "The message from the Trust is clear - we need to link to the rest of the Internet". Jem provided several key words of advice on how to make an openness and accountability blog work. Some senior people who are willing to get involved in the making of the blog and actually respond to issues flagged up. A cool head when things go wrong - see the fall out and turnaround from these comments about Linux. Phil wanted to know how the BBC could make some awesome online videos. Again he has a full blog post on this so if you want a more detailed view click here. Acknowledgement that video on the web is different to video on the TV. Polished production values seem to be a bar to web videos. Some of the most popular YouTube videos are by people with a shaky camera producing something funny or amusing. Authenticity and 'cultural currency' the key to online success. And indeed Jo Twist had some interesting things to say about social viewing - something she also discussed in her own panel (scroll down to 11.40am). What was the BBC doing in this area? Change in production values needed. But important to realise that quality still important in some cases even if the style might be different. There seemed to be quite a lot of emphasis on how BBC videos, hosted on the BBC YouTube Channel, for example, could be made more popular and get more page views. I asked whether this should be the only consideration. Yes, it fulfils one part of the public service remit but there's also a charge for the BBC to represent minority interests. Afraid this wasn't really taken up as discussion moved elsewhere. Afterthought from the memory bank - is the new Gary Lineker sport promotion video with the football shirts not based on a YouTube idea? Further Reading: Phil's blog post on online video. Of course, three categories here - External personal blogs, public-facing BBC blogs, Internal BBC blogs. Is there much value in the BBC's internal blogs? Roo suggested there wasn't much going on here. Might be better to use different tools other than a blog. There's an internal wiki to discuss BeebCamp for example and Yammer is being used as an 'internal' Twitter. Aim of my panel was to start a general discussion about the use of blogs in news - where the BBC might go next with blogs and what are the limitations to using blogs in news. Obviously this was with the intention of creating some great research material - in academic speak it was a ready made focus group. Hopefully though it sparked a useful conversation and some new ideas. I was pleased with how it went. Had a good range of input. I kicked off by outlining what I believe to be three general models for the BBC using blogs in news - other people's blogs, BBC reporter blogs, and BBC programme blogs to build a news community. A few panelists wanted foreign correspondents to use Twitter - thought it could be really interesting. Afterwards Daniel Morris from BBC Switch told me how he used several different Twitter accounts to cover a live event. Could that sort of thing be replicated in news? Further Reading: Roo Reynolds; Tom Van Aardt (coming soon?). Will have to see. But I felt it was a really positive day. Further Reading: Jason Da Ponte who went to a completely different set of panels. 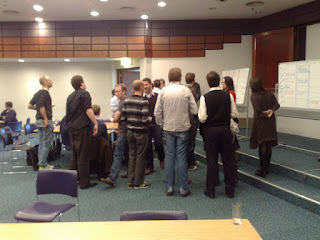 Today at work I attended Beeb camp, a cheerfully titled unconference. we have been to quite a few barcamps in the past, which are similar in principle, but not at work so this was going to be a special experience. It wasn’t arranged by manglement, but by a few interested bods around the BBC.